The story of the universe is written in the light that travels through it—the light that we can capture, that is. Nearly everything we know about how the universe works on its grandest scale comes from the analysis of light, of photons that may have journeyed for nearly fourteen billion years to reach us from the Big Bang itself. In Five Photons, astrophysicist James Geach serves as our guide on this cosmic voyage. Have you ever wondered what the most distant source of light we can see is, or how a star shines? Did you know that black holes can blaze like cosmic beacons across intergalactic space, and that ancient radio waves might herald the ignition of the very first stars? Have you ever thought about what light really is? Geach explains all through five tales of fascinating astrophysical processes that propel light across space and time. They are tales of quantum physics and general relativity, stars and black holes, dark matter and dark energy. 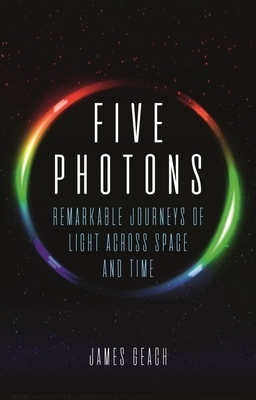 Sweeping us away on electromagnetic waves, Five Photons is a journey of discovery toward a deeper, more enlightened understanding of this breathtaking universe. James Geach is a Royal Society University Research Fellow and reader in astrophysics at the Centre for Astrophysics Research at the University of Hertfordshire, specializing in observational cosmology and the formation and evolution of galaxies. He is the author of Galaxy: Mapping the Cosmos, also published by Reaktion Books. "Light illuminates cosmic origins and decodes quotidian realities. But what is it? This deft primer by astrophysicist Geach captures the elusive electromagnetic wave in five processes. His meditation on ‘old’ light takes us back to the singularity: the 'cosmic seed' that expanded into the Big Bang. A study of starlight plunges us into the seething stellar surface. We peruse dark energy, radio waves and quasars—beacon-like galaxies in which supermassive black holes feed off interstellar gas and release vast amounts of energy. A masterclass in elucidating hard science with elegance and brevity." "Light permeates almost everything around us. It is the primary way in which we communicate and with which we try to understand the Universe. Light is the central theme of Geach’s book. After an introductory chapter on what light is, the book identifies five different sources of light that are key probes of the cosmos. This framework allows Geach to cover everything from the cosmic microwave background, to stars, dark energy, black holes and the epoch of reionization. No equations are to be seen and the style is conversational, making this book a perfect entryway to anyone interested in learning a bit more about the inner workings of the Universe." "What makes Five Photons different . . . is the depth that Geach goes to—not in a mathematical sense, but in describing subtleties of the work of astrophysicists and cosmologists that popular science titles usually gloss over. . . . Think of it as a sequel to A Brief History of Time that explains some of the real detail of what has been discovered and brings in factors cosmologists have to consider that you won’t see anywhere else in a popular science title." — Caleb Scharf, author of "The Zoomable Universe"
— Lee Billings, author of "Five Billion Years of Solitude"